It's never too early to save a date on your calendar. Hold a spot for This event also benefits the North Suburban YMCA. Fashion and Service - always hand and hand! 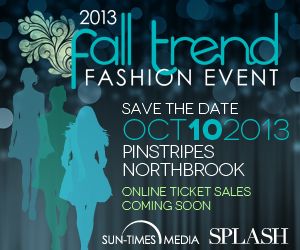 Thursday, Oct. 10 at Northbrook, IL Pinstripes, 1150 Willow Rd. TICKETS: $75/$150 VIPs. VIP pricing includes preferred seating at the runway show, a gift bag, other goodies and a VIP after-party and a chance to buy looks off the runway.